The 300C's outrageous American looks were not to all tastes, but it's basically a Mercedes E-Class underneath. 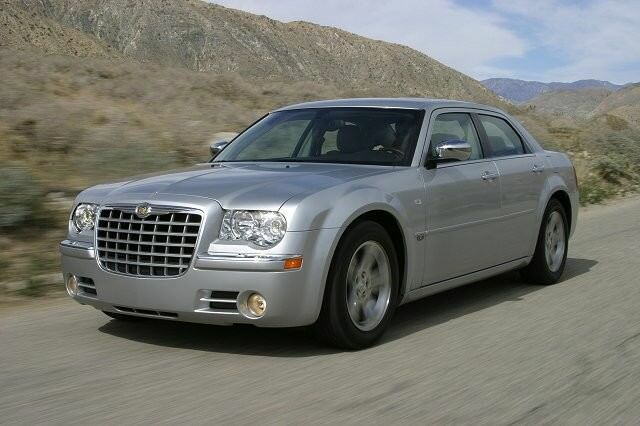 Chrysler’s most convincing product in Europe was the 300C, the bold saloon arriving in 2005. It was largely based on the underpinnings of the previous Mercedes-Benz E-Class, Chrysler at the time being in partnership with Daimler, forming DaimlerChrysler. It was a distinctive looker, with broad shoulders, a narrow glasshouse and American sizing (it’s big). The conventional saloon was quickly joined by a Touring (estate) model that added a bit more practicality and even more outrageous lines. The 300C’s home market is indisputably its most important one, which goes a long way to explaining the engine line-up offered in Europe. The 300C definitely got the engines you’d expect it to feature given its styling, with a range of V6s and a couple of V8s to make the big four-door a quick machine. The base 300C was a 2.7-litre V6 with 193hp, while a 3.5-litre V6 with 253hp was also offered. The V8 engines came in a choice of 5.7-litre with 340hp or 431hp 6.1-litre HEMI in the range-topping SRT-8 model. That monster would reach 100km/h in 5.2 seconds from rest and had a maximum speed of over 250km/h. You’ll be doing very well indeed to find one of those for sale here, and need to be doing very well indeed to afford to run one if you do so. Thankfully, we European buyers weren’t completely ignored by Chrysler, as the 300C also received a 3.0-litre V6 turbodiesel slotted under its lengthy bonnet. It might be un-American to stop at the black pump, but with fuel prices and tax in Ireland meaning those petrol choices are no-goes for all but the wealthiest buyers, the 3.0 CRD is about the only 300C you’ll find in the classifieds. Like all its relatives it was an auto-only choice, the 218hp it delivered going to the rear wheels. Inside, space is plentiful and there’s a big boot, the Touring adding a bit more practicality and even more attitude - if you can believe that’s possible. The diesel brought respectable economy to the 300C, with a combined consumption figure of 8.8 litres/100km, yet still managed 0-100km/h in a quick 7.6 seconds. Being from the American school of sales, all 300Cs came well equipped, with a toy count far greater than any of its European rivals, so don’t settle for anything less than fully loaded. In a world of bountiful, cheap and environmentally-friendly petrol we’d have a HEMI 6.1-litre SRT model, but then that’s not the case, so the 3.0 CRD it is. The Touring appeals to us for its more extrovert looks, though it’s very rare; saloons are more plentiful. Not as polished to drive as its European rivals. Dare to be different, then the Chrysler 300C is about as bold a big saloon car choice as you could ask for. It’ll likely cost you more than one of the German premium saloons to run - not least as Chrysler specialists and parts supply won’t be as readily available - but if you’re prepared for a bit of extra work then the 300C is worth considering.